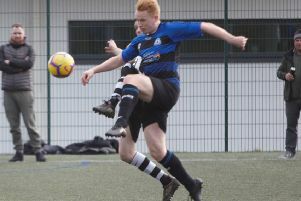 Ovenden West Riding managed to beat the freeze but not Route One Rovers in a West Riding County Amateur League fixture at West Vale on Saturday. Route One ran out 5-2 winners on a low-lying pitch which was soft on top. The visitors probed another much-changed Ovenden side with their attractive football and Shoab Iqbal and Irfan Afzal dominating the midfield. Route One went in front when Danyal Yasir broke through on West Riding’s left and his neat footwork created the opening for Afzal to beat Tom Boyle from five yards on 15 minutes. West Riding were struggling to mount any sustained pressure on the Route One goal. Jamie Keegan and Nathan Sloan were prominent but could not find a way through. Simmi Oyebanji made it 2-0 on 25 minutes when he was on hand to finish off a left wing move set up by Samear Ahmed. Jordan Pettifor went near for Ovenden before, on 40 minutes, Afzal made it 3-0. Route One continued to dominate and Oyebanji added a fourth from close range on the half time whistle. After the break Ovenden manager Scott Griffiths reshuffled his side. It paid dividends on the hour mark when a Maison Butterfield free-kick was headed home by Keegan. Ten minutes later Ashton Lewis sent Sloan away on the right and his sweetly struck 15-yarder was too good for Imran Yousef. It was all Ovenden now with Toby Young, Pettifor, and Keegan all missed glaring opportunities. With five minutes remaining the home side were punished when Oyebanji completed his hat-trick with a speculative effort from 18 yards.